Reginald Andre Jackson as Macbeth in Seattle Shakespeare Company’s 2011 Wooden O production of “Macbeth.” Photo by Alan Alabastro. This summer Seattle Shakespeare Company will celebrate 20 years of free Shakespeare in the parks with productions of the Henry V and The Tempest. Performances of both productions will begin on Thursday, July 11 and will run through Sunday, August 11, 2013. Mount will direct Henry V assisted by fellow founding Wooden O company member Vanessa Miller. In Henry V a young, untried king tests his mettle in battle against overwhelming odds. His army dispirited and outnumbered, his conscience unsure of his cause or his abilities, the young King Henry learns that leadership is far more than just being the one with the crown. Actress and director Kelly Kitchens, who will appear as Kate in our upcoming production of The Taming of the Shrew, will direct The Tempest, Shakespeare’s magical tale where revenge yields to forgiveness. Exiled by his younger brother and marooned on an enchanted island with his daughter, the aging sorcerer Prospero discovers the human heart wields a greater power than all the spells at his command. 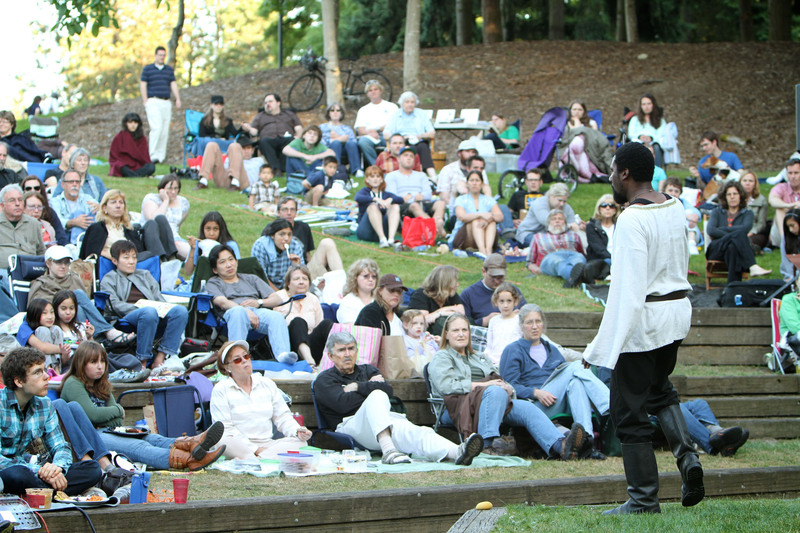 Seattle Shakespeare Company’s free Wooden O shows will be performed in parks at Mercer Island, Sammamish, Seattle, Lynnwood, Edmonds, SeaTac, Issaquah, and Shoreline. All performances are free and open to the public with donations encouraged at the site. Specific dates for venues as well as additional performance venues will be announced at a later date.